-Have you hit a plateau in your health/weight loss/fitness efforts? -Are you tired of not feeling or looking how you want? -Are you struggling to get the results you feel your efforts should yield? -Are you not feeling as good as you once did, but can't figure out why? -Have you tried other products and programs with little, to no sustainable results? -Are you ready for a science based program clinically designed to help you heal your gut at the root cause level? If you answered "YES", to any of the above, I highly recommend you learn more about how this program can heal your Gut Health and help you achieve vibrant health and wellness for years to come! A 30 Day Gut Healing Protocol designed from successful strategies used in hundreds of clinical cases. For optimal results, I recommend continuing for 60 days. Those that maintain the majority of the diet and lifestyle changes are best able to maintain results and achieve long term gut health. This program includes specific dietary protocols, lifestyle modifications, and three key gut support supplements, all designed to remove sources of physiological stress on your gut, reduce GI inflammation, heal "leaky gut", support the body's immune system to aid in eliminating GI pathogens, restore microbial balance to the microbiome, improve digestion and absorption of key nutrients, and much more! Lab Testing relevant to this area of your health (GI pathogen testing, Leaky Gut testing, Food Sensitivities etc.) is NOT required, BUT HIGHLY RECOMMENDED. This protocol is based on the most typical strategies I use to address poor test results. I prefer to test, not guess, but I also believe it can be beneficial to use fundamental healing strategies to see how far that can get you before deep diving with lab testing (which can get pricey; which is what inspired the DIY Program to begin with). -DSL GI Map: DNA PCR stool analysis to identify parasitic, bacterial, viral, worm, fungal pathogens in the GI tract, and assess for digestion, immune function, gluten sensitivity, "leaky gut" (zonulin), and inflammation. -Genova Intestinal Permeability Assay: a lactulose/mannitol challenge test to assess for intestinal permeability, or "leaky gut". -BioHealth SIBO Breath Test: A lactulose/glucose challenge test to assess for small intestinal bacterial overgrowth. -Oxford Biomedical Mediator Release Test: A food sensitivity test that challenges your immune response with 170 foods/chemicals to assess for inflammatory reactions. To inquire about these lab tests email: info@metabolicsolutionsllc.com, or submit the form below. Those suffering from any of the above symptoms. Those diagnosed with any kind of inflammatory GI disorder. Those suspecting impaired gut health might be at the root of their health issues. *Note: as a Functional Practitioner and Clinical Advsior, I can tell you from working with and advising hundreds of clinical cases, that more often than not, gut dysfunction is at the heart of many typical health complaints and conditions. Health starts in the gut! What can I expect for an outcome? Most GI related symptoms (such as listed above) should improve substantially if compliance is adequate. This will in turn have a positive impact on virtually every aspect of your health, as the gut is the absolute foundation of your well being. Like anything, you'll get out of it what you put into it. Please keep in mind, as noted in the DIY SELF HEALING PROGRAM description page, these programs use advanced functional strategies that I use regularly as part of many clinical client's customized healing protocols. With that said, the DYI program was created as an alternative to working with a Functional Practitioner privately, as a way to offer the best information science has to offer at a lower price point. Due to the fact the program is not customized to you specifically, or based off objective data about your unique metabolism with lab testing, results may vary. My best advice is to try the program if you feel it resonates with you, and if the results are not realistic for the effort put forth, you should consider working with me privately to identify your unique needs. This is a before and after of the Genova Intestinal Permeability test for a real client, which demonstrates how effectively this program can heal "leaky gut". She was able to drastically improve her intestinal permeability and reduce many of her unwanted symptoms! What do others have to say about the Gut restore program? “Before I started the Gut Restore 2.0 program, the only time my stomach wasn't bloated was when I woke up in the morning. After eating it was only a question of how much bloating I would have, not whether or not it would happen. Because I was almost always bloated and uncomfortable, I also felt sluggish. My workouts weren't going well and it wasn't pleasant to move quickly or complete my sprint intervals. I needed a ton of coffee to get going in the morning and to stay focused throughout the day. About halfway through the program, all of that is gone. I have more energy than I can ever remember having (without all the caffeine). My workouts are going well and I'm more comfortable, but I also feel better in ways I never expected. I have less brain fog, it's easier for me to concentrate at work. I'm also sleeping better and waking up refreshed, which means I'm dragging less throughout the day. I can't wait to find out what the second 30 days on this plan brings. I already feel leaner, more at home in my own body and I finally don't feel like it's fighting all food. Even after completing the program, I feel like I now have a go-to protocol to follow if I ever start feeling heavy and sluggish again. I always thought my problem was anxiety that was causing poor sleep, but this program has completely changed how I think about my health and how highly I value taking care of my gut.” ~Linnea Z. What is the cost of the program and how can I sign up? The cost is $175. This includes a 1 month supply of the 3 key gut support supplements (pictured below). I do actually recommend following the protocol for a full 60 days to get best results and it's ideal to try to maintain most of the changes implemented. A second month's supply of the 3 supplements can be ordered for $125 by emailing info@metabolicsolutionsllc.com or by visiting the shop using the link below. To order, click here to go to the Shop! 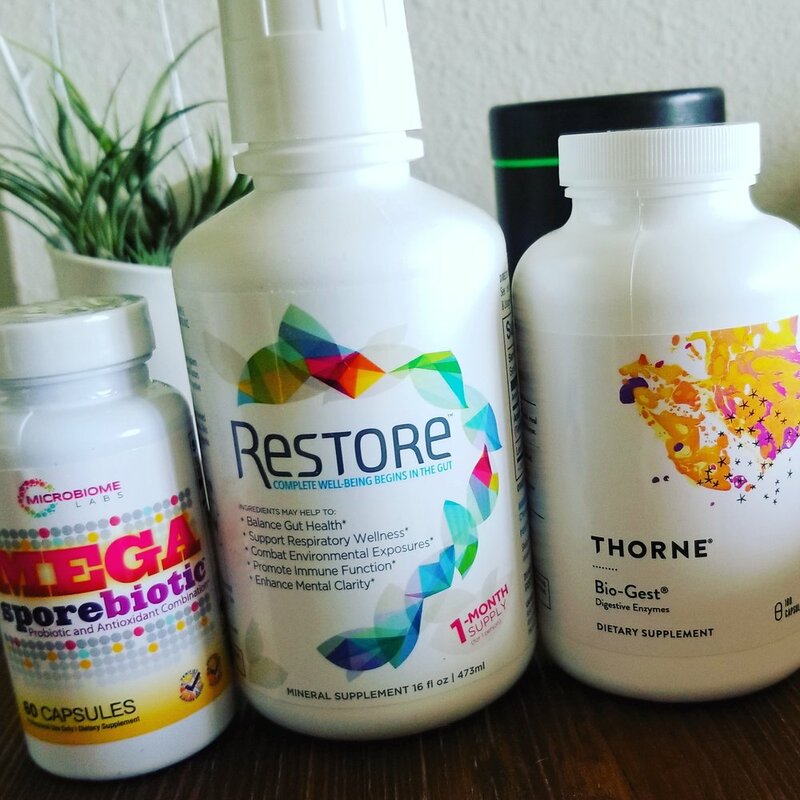 3 Key Gut support supplements I have used in hundreds of successful clinical cases. I am not a licensed physician and do not pretend to be. If you have concerns about your medical needs, please consult with your physician. None of my products or services are intended for the treatment, management, or prevention of any medical condition. *All Protocols are currently available, although the web pages are under construction. Please email me to inquire about any of the above programs. A complimentary 15-minute phone consultation can be scheduled here.